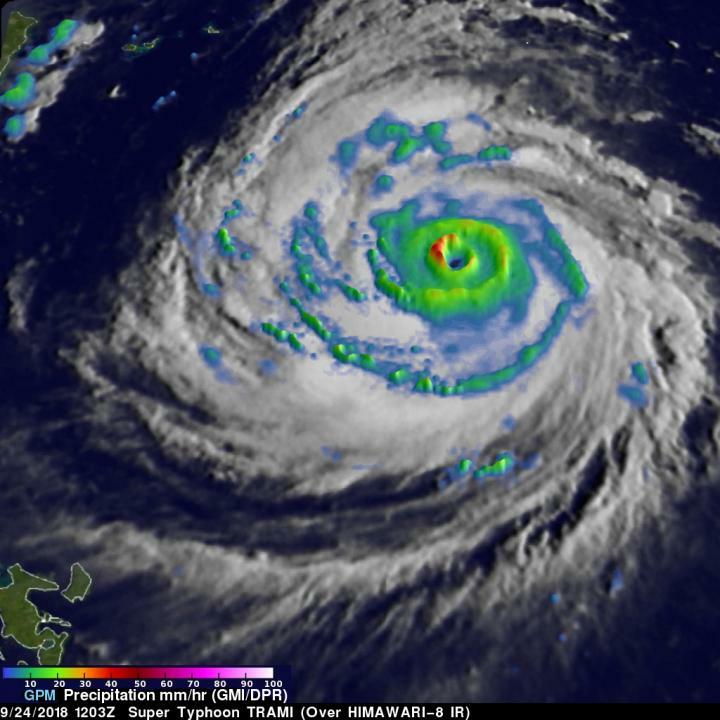 The Global Precipitation Measurement mission or GPM core observatory satellite probed super typhoon Trami when it traveled above the northwestern Pacific Ocean and provided an analysis of heavy rainfall and cloud top heights. GPM, a joint satellite mission between NASA and the Japan Aerospace Exploration Agency, JAXA, flew over Trami on Sept. 24, 2018 at 8:03 a.m. EDT (1203 UTC). At that time Trami had maximum sustained winds estimated at 130 knots (150 mph). Rainfall measurements were made using data collected by GPM's Microwave Imager (GMI) and Dual-Frequency Precipitation Radar (DPR) instruments. GPM's GMI showed the locations of extremely heavy rainfall in the super typhoon's well defined circular eye. GPM's radar (DPR Ku Band) coverage was limited because its swath only included storms on the western side of the typhoon. GPM's DPR showed that rain was falling at a rate of over 120 mm (4.7 inches) per hour within intense storms in a strong feeder band well southwest of Trami's eye. The Joint Typhoon Warning Center (JTWC) used that GPM pass in an evaluation of super typhoon Trami. JTWC's summary and analysis said that, "A 241201Z (Sept 24 at 8:01 a.m. EDT/1201 UTC) GPM 89GHZ microwave image clearly reveals an ongoing eyewall replacement cycle with concentric rings and a moat feature evident." On Sept. 25 at 5 a.m. EDT (0900 UTC) Super Typhoon Trami had maximum sustained winds near 155.4 mph (135 knots/250 kph). It was located near 19.9 degrees north latitude and 128.9 degrees east longitude, about 401 miles south of Kadena Air Base, Okinawa, Japan. Trami is moving slowly to the north-northeast. At that time, animated enhanced infrared satellite imagery depicts a symmetric eyewall surrounding a 35 nautical mile-wide oblong eye. Trami will weaken very slowly as the storm moves very slowly north. After two days, the system will speed up as it continues to weaken, eventually veering northeast. Trami is expected to still have winds of about 100 knots (115 mph) when it moves into the East China Sea northeast of Taiwan on September 29, 2018.